It would be easy to come out and just say “Ansel Adams' Camera was a Deardorf 8×10 View Camera or a Hassleblad 500c Medium Format or any number of 4×5 cameras and 35 mm cameras among many other formats.” All would be true. Like most of us today, he wasn’t limited to just one specific piece of equipment. In fact, it wouldn’t even be safe to say that he favored one camera system over any other. Each had their role and Adams was always careful to be sure to use the correct tool for the job at hand. In his book “The Camera” Adams discusses the importance of “…some understanding of the nature of various camera designs and their capabilities, in the hope that the photographer will consider these discussions in the context of his or her individual intentions and style.” This is a sentiment that is echoed today. A solid concept of visualization of the desired result is then followed by the photographer using the correct equipment for the job. However, one will notice that they will tend to see the world a little differently depending on the equipment they have at hand to capture the moment. I relied on a variety of sources when researching this topic. These included the Ansel Adams Gallery Website as well as various pages on Wikipedia and across the internet. The pages are utilized primarily for links to images of the various systems. Images which are not included here so as not to infringe on any copyrights. The richest source of information with the technical details about the equipment and capture (as well as processing) of some of Adams’ best known works was the book titled Examples: The Making of 40 Photographs. 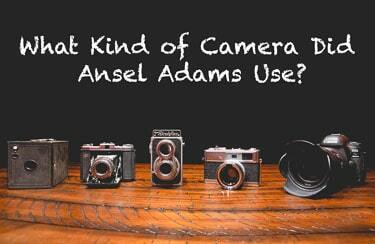 The Camera (The Ansel Adams Photography Series 1) is another great resource on the topic. I Highly recommend picking up these books if you are at all interested in the stories behind these photos. They serve as a great companion read to this article, or really, the other way around. I didn’t focus on lenses for this article as I didn’t think going that far down the rabbit hole would add a lot of value. Adams had numerous lenses in his collections over the years and just as we do today, he took care to be sure to utilize the specific lens that the situation called for. This was all part of the “pre-visualization”. 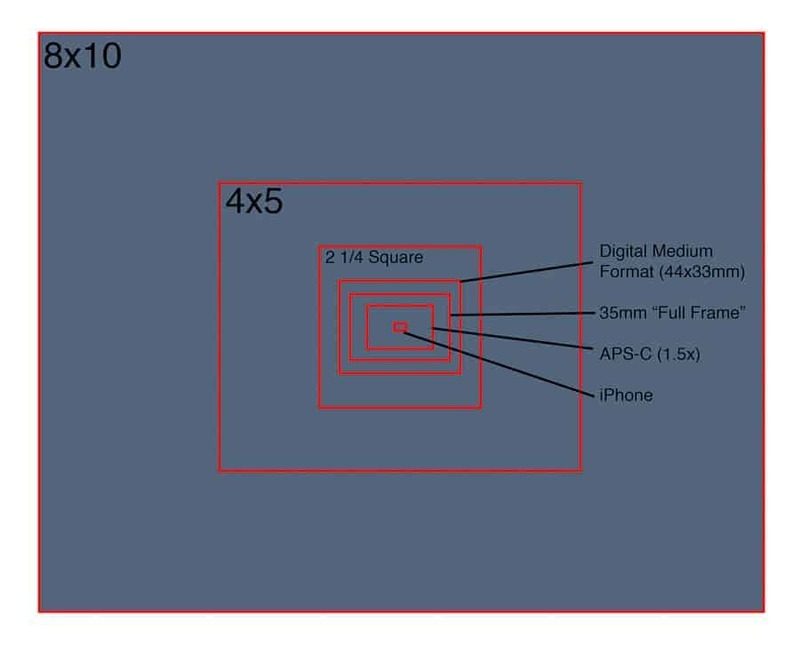 Should you choose to dig into the topic, you will find that the focal lengths used on the larger format cameras (especially the 4×5’s and the 8×10’s) are vastly different than what you may be used to. First, Ansel usually references them in inches rather than millimeters. Also, with those larger formats, they have much longer focal lengths. An 8 x 10 camera has a crop factor of roughly 0.1 giving a 300mm lens the same field of view as a 30mm lens on an full frame camera. This brings up the overall larger topic of Field of View. Field of View could be an article all by itself, but I want to address it very quickly here. The key is simply that there is a larger area capturing light than what we may typically be used to in the digital age. The frame sizes of the film used by Ansel Adams and others who employed (and still do) the larger format cameras are much larger. They can be compared to sensor size if you want to think of it that way. 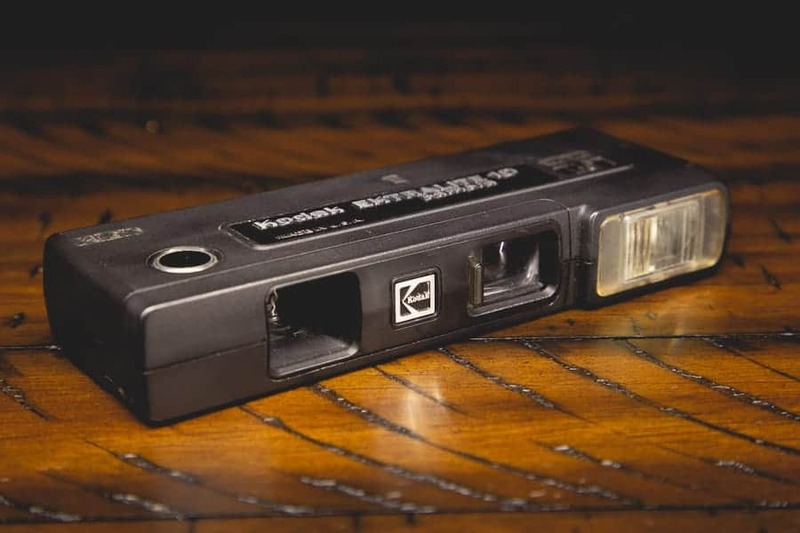 If you’re like me, you probably remember the first camera you ever used. The experience of creating your first image is something that sort of sticks with you and it can be intoxicating and addicting to say the least. Even my two children (ages 4 and 2) have been taking photos and loving it. Not surprisingly, their first camera experiences were with iPhones and iPads. Quite a bit different than my first experience and probably yours as well. Ansel’s first camera was quite a bit different again. Perhaps. According to his biography page on the Ansel Adams Website, his first camera was a Kodak No. 1 Brownie Box camera. The original info page on this camera is archived on the Wayback Machine and has some interesting information about the camera. It shot 117 format film (defunct) which is very similar to 120 with a slightly different spool. No. 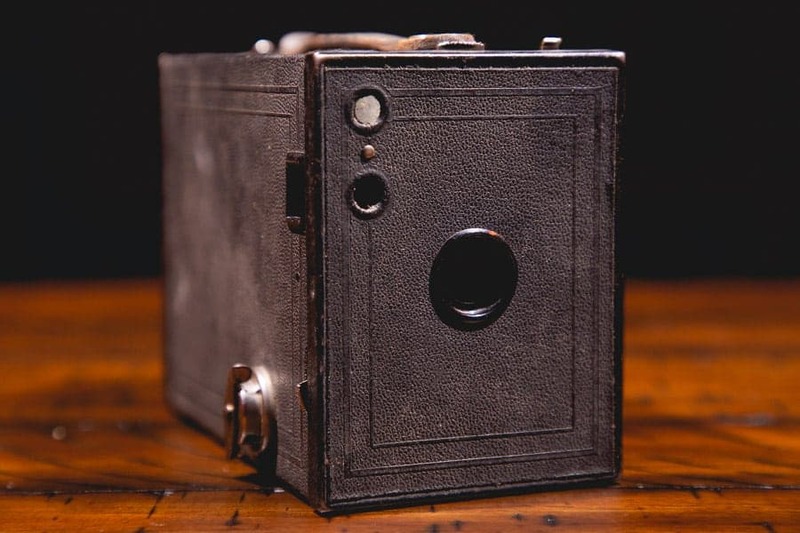 2 Brownie Box Camera released by Kodak in 1924. Not the No 1 that would have been used by Ansel but this one shoots 120 roll film which is still readily available. The image size is 2 ¼ x 3 ¼. I picked this at an antique mall for $12 US and it still functions perfectly. These Brownie Box Cameras (often referred to as “the most important cardboard box ever”) are still available in various conditions on sites like eBay and antique stores with fairly inexpensive price tags. I frequent antique stores and see them on every trip. The first camera I ever used to take images was a Kodak 110 format camera like this one. What was the first camera you ever used? According to his account in “The Camera” Ansel’s first “serious camera” was a Kodak Speed Graphic in 2 ¼ by 4 ¼ inch format. The 8×10 (8 inches by 10 inches) format was definitely a favorite of Adams. These cameras come in many form factors. 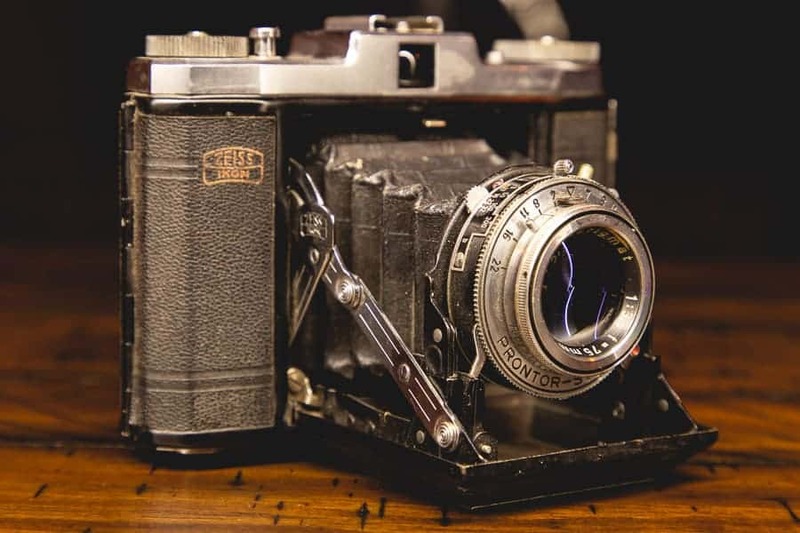 The setup consists of a front standard which holds a board containing the lens and a rear standard which holds the film holders with film sheets pre-loaded and protected from exposure by use of a dark slide. The 4×5 inch versions are similar in design and operation, though they are much smaller and record images onto 4 by 5 inch film sheets. Think of it as a different sensor size, both of which are MUCH larger than what we are used to in the digital age. Between the two standards is a bellows, which is an accordion like device that is light tight and allows the front standard to be positioned closer to or farther from the rear standard. This in and out movement is how the camera achieves focus. The cameras also usually allow for specialized movements of the front and rear standards to manipulate depth of field by tilting the focus plane and perspective by shifting the lens up or down. If this bit sounds familiar, its exactly the same way a tilt-shift lens works. The rear standard movements may also be employed to achieve distortion corrections by repositioning the film plane rather than the lens. There are two primary form factors for these cameras. The mono-rail cameras achieve movement by having the front standard slide along a rail onto which it is clamped. The other form factor, consistently used by Adams is the field camera which folds up into a suitcase like box for “easy” transport. 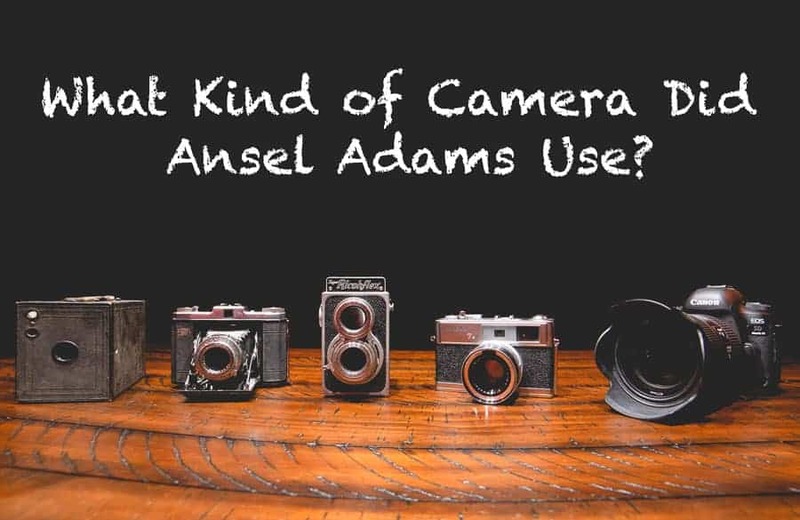 To take a photo with this type of camera, Adams would set up the camera and use the ground glass at the film plane to compose his shot and achieve focus. Ground glass is a semi-transparent piece of glass which the image from the lens shows up inverted. It gives the photographer a preview of what their image will look like. From here a film holder is loaded and the dark slide removed. Metering of the scene is critical with these systems and Adams always (almost) used his trusty Weston Exposure Meter. I say “almost” because by Adams’ account he couldn’t find it in time to use it for the famous exposure of the Moon Rise over Hernandez. He had to use the known luminosity of the Moon as his guide along with some heavy math. Then, exposure settings are set on the lens and the exposure is made. On these cameras, the shutter lives inside the lens and the lens serves as the gatekeeper for all light entering the camera. It is safe to say that Adams did a lot of work with various Polaroid cameras. He did a lot of consulting work for his friend Edwin Land who founded the Polaroid company. The cameras were unique in that they were the first to produce “instant prints”. There probably isn't a model that came out in the 50's or 60's (and even later) that Ansel didn't use at one point or another. For shots that didn’t call for a large format 4×5 or 8×10, Adams would commonly use cameras that shot the medium square format 6×6 or as he noted it 2 ¼ inch. This format is legendary in its own right as it served as the inspiration for Instagram’s square aspect ratio (love it or hate it). The Zeiss Ikonta B (523/16) is a close relative to one of Adams' favorites (the Super Ikonta B). This is a later model (1953) and shoots the same 2 ¼ x 2 ¼ format. 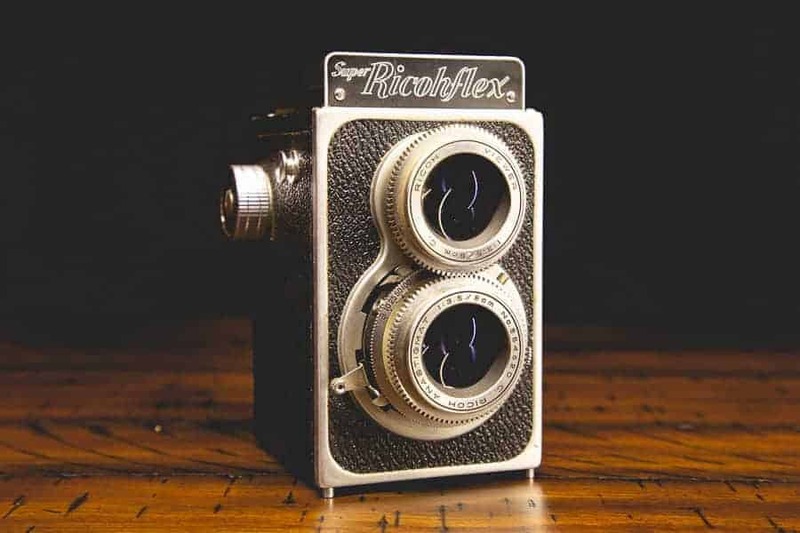 Another type of camera that shoots the 6×6 frame is this Super Ricohflex. Known as a “TLR” (Twin Lens Reflex) the photographer looks through one lens via a waist level viewfinder and takes the image with a separate lens. TLR's are readily available and a ton of fun! The top dog being the legendary Rolleiflex which was the first. They've even launched a kickstarter campaign for a new TLR that shoots instax film! Adams was no stranger to the format most of us are most familiar with. What he referred to as “small format” was the 35mm (24mm x 36mm) frame size which has evolved into what we call “Full Frame” today. Most of Adams’ 35mm work was in portraiture and he used countless different cameras in this format. 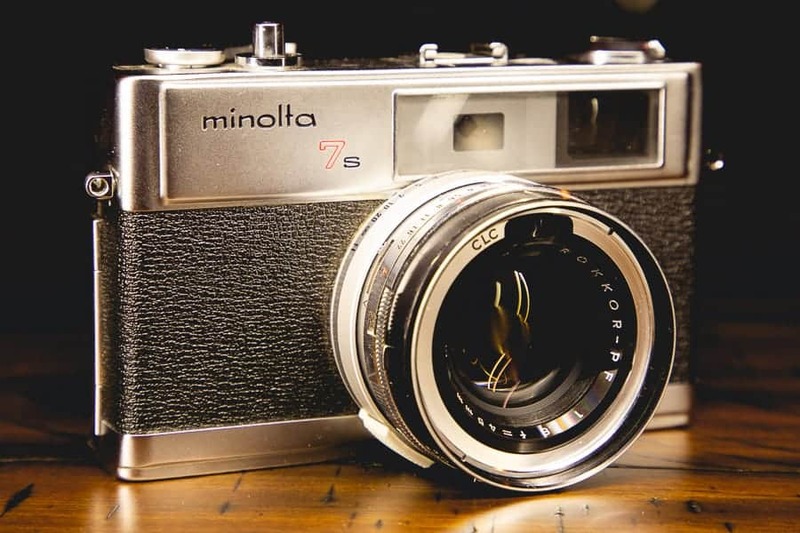 My own 35mm Rangefinder, the Minolta 7s which would be similar in operation to the Contax cameras used by Adams. I would be remiss if I did not mention the latter half of the process. Development of the negatives and then the resulting prints was as important as the actual exposure made in the field. In examples, Adams goes into extreme detail on how he developed each negative and how he processed the prints. We still do this today and it is ever important as a part of the craft. The difference today is that we take digital files into a “Lightroom” rather than a darkroom and process them digitally sometimes using the same processes and techniques (adapted of course) as Adams. Ever do any dodging and burning? One would have to wonder what kind of images Adams could create if we gave him some digital files, Photoshop and some time to figure it out. Would Adams Have Embraced the Technology We Use Today? I think the short answer to this is “Yes”. Now, camera systems that Ansel would have used are still used on a surprisingly regular basis today. There are well known photographers who shoot on the 4x5s and even a few who shoot on the 8×10 systems as their primary camera systems! Would he pick up a full frame mirrorless camera and use it? I think he would and I think he would make great images with it. The gear may have changed, but the fundamentals of photography have not. If you read through his books, you will find that the technical details of the capture are actually quite familiar.